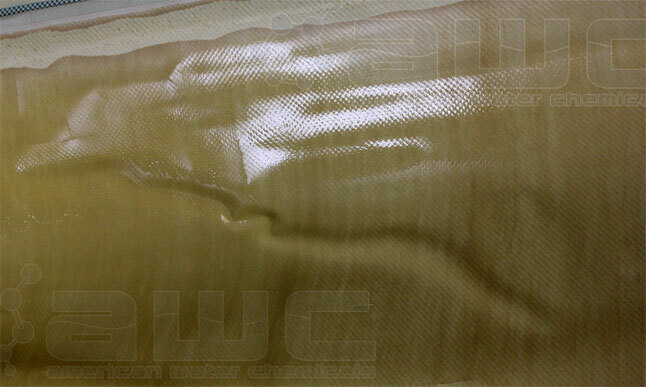 American Water Chemicals (AWC) recently received a tail end nanofiltration membrane for autopsy from a client who was experiencing issues with disinfection byproducts in their finished water. Water testing had confirmed that the NF membranes were not rejecting the high organics in their feed water, and the client was concerned that the membranes (which were in use for less than a year) were not performing per the manufacturer’s claims.When our engineers cut open the membrane, the first thing that caught their attention was that the membrane leaves were “pouching”. In other words, they had a “ravioli” like appearance (see Fig. 1). Our engineers immediately recognized this as a symptom of damage from excessive permeate backpressure. When a permeate valve is closed during operation or cleaning, the permeate pressure can build up until it equals the feed pressure. The tail element, on the other hand, has a lower pressure on the feed side because of pressure losses (∆P). 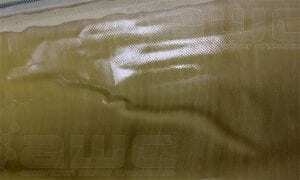 As a result, the permeate pressure can exceed the pressure on the feed side, resulting in “ballooning” of the membrane leaf, and causing delamination of the thin film polyamide layer from its polysulfone substrate. Damage from permeate backpressure can also occur when a permeate check valve fails in an idle train, and permeate flows back in the reverse direction either because of head pressure from a high storage tank, or from back pressure applied by the permeate streams of other running trains. 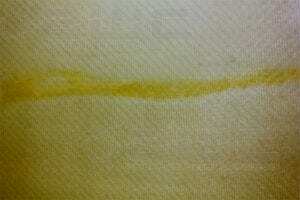 When the membrane leaves were spread open for inspection of the membrane spacers (Tricot), every permeate spacer in the element was found to have a large, localized stain. 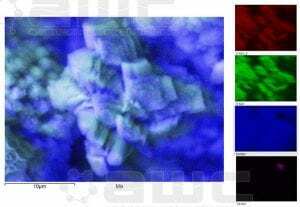 This indicated that the membrane had delaminated and lost its ability to reject organics (see Fig. 2). 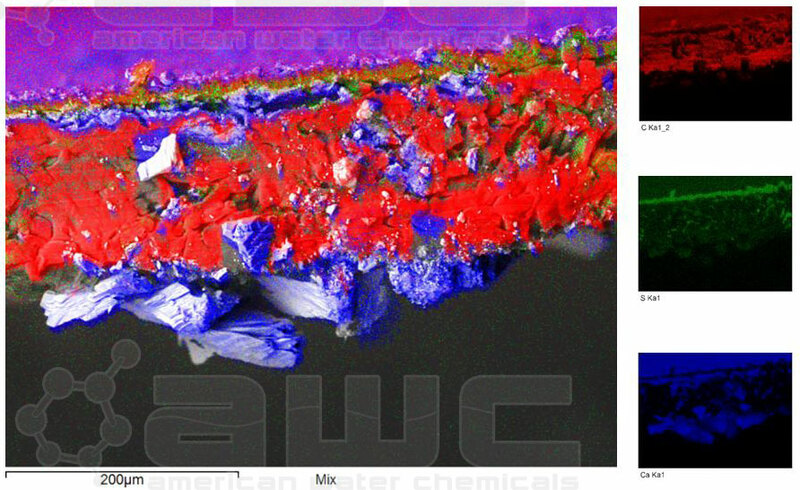 Further investigations included performing flat sheet tests to determine the salt rejection of the membranes in areas that appeared intact while comparing them against membrane samples from the areas where the organics had stained the permeate spacers. Our engineers found the membrane generally had a 69% salt rejection, but that the damaged areas had only a 9% salt rejection. 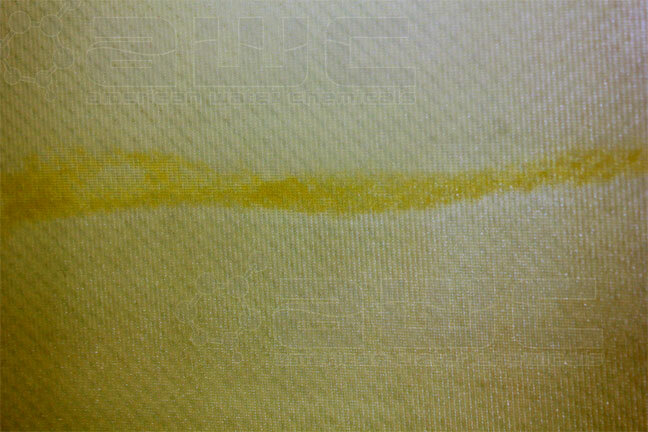 Because the membrane sample was covered with a significant amount of deposit, we could not visibly see delamination. Using Scanning Electron Microscopy and AWC’s SEI™ techniques, it was determined that the membrane was heavily scaled with calcium carbonate (See Fig. 3). 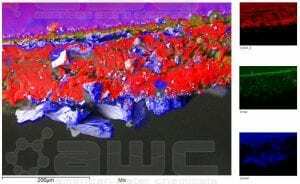 The calcium carbonate scaling could be seen across the entire cross section of the membrane, penetrating completely through to the polyester support structure on the permeate side! (see Fig. 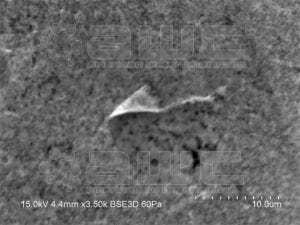 4 and 5) This was another indication that the membrane had been damaged. Because calcium and alkalinity are well rejected by NF membranes, it would have been impossible for calcium carbonate to form on the permeate side of an intact membrane. 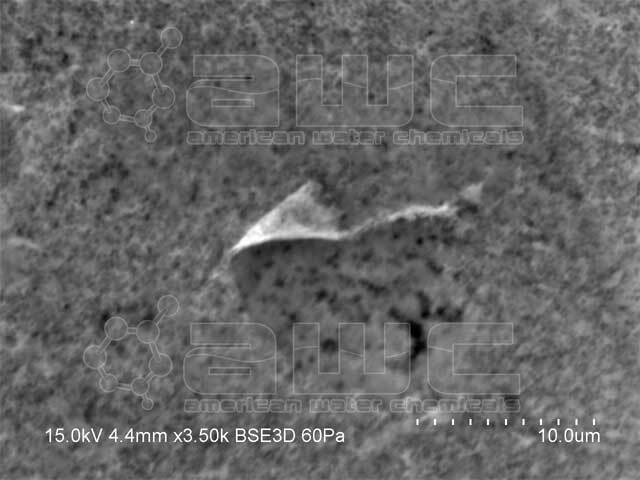 A low pH cleaner was applied to the feed side of the membrane and the membrane surface was once again viewed using SEM. 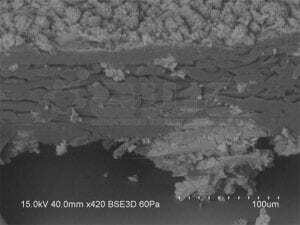 We could now clearly see the delamination of the polyamide layer that had occurred (see Fig. 6). There was now ample evidence that the membrane had been damaged due to an operational oversight and was not under-performing due to quality issues from the manufacturer. Damage due to excessive permeate backpressure is one of the most common causes of mechanical damage to RO/NF membranes during operation.